Capital athlete Libby Clegg – along with fellow Scots Stef Reid, Derek Rae and Sammi Kinghorn – have been added to the British athletics squad for September’s Paralympic Games in Rio. The quartet will join previously-selected Scots Maria Lyle and Jo Butterfield in a 54-strong team which includes 13 gold or silver medallists from last summer’s IPC world championships in Doha. 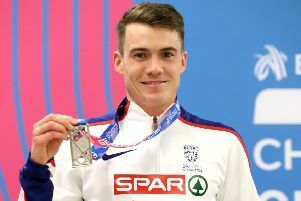 Kinghorn was a certain pick after setting five European records in three weeks earlier this year while Rae booked his spot with 12th place at the London Marathon. Team chiefs will trust Reid, who took F44 long jump silver four years ago, will bounce back from recent injury woes with two-time silver medallist Clegg, who missed most of last season with her own injuries, confirming her return to form with a world record in the T11 200m in London last weekend in tandem with new guide runner Chris Clarke. “I’m delighted to be selected for my third Paralympic Games,” the visually-impaired sprinter said. “It’s been a whirlwind of a journey since London after a number of injuries but it’s great to come through the other side and be a part of a really strong ParalympicsGB team heading out to Rio.